Amidst all this we needed to tie up loose ends, finish off projects and pack up our house and home for the last 15 years. 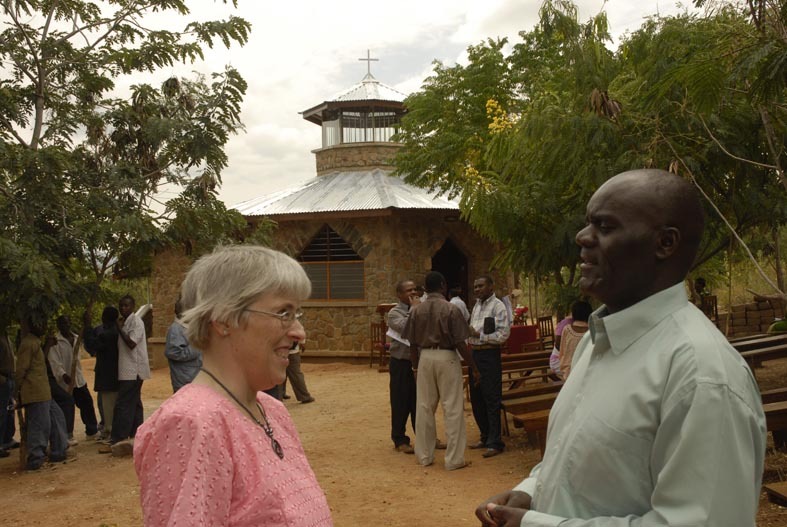 Of course our partnership with the Church in Mpwapwa, and the friendships made will continue as we pray for and follow the ongoing work of the Church in that part of Tanzania. Since arriving back in June we have been able to enjoy end of term events and yet more goodbyes as both Esther & Christopher will be moving on this coming term to new schools – for Esther it just means a step across the road to the Senior School, though for Christopher it means a whole new town as he takes up a place at the Grammar School in Gloucester. Timothy will also be starting for the first time as a day pupil at yet a third school, the other side of Cheltenham. 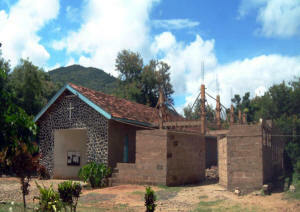 We were thrilled to see the completion of St. Luke’s Chapel, even if it was still being glazed on the day we finally left Mpwapwa. It was officially consecrated a few weeks before that, which also gave the Diocese its opportunity to give us a more formal send off. Needless to say, as we look back on the Mpwapwa years we take with us some very happy memories, a real sense of privilege in having shared in taking God’s Word to God’s People and great satisfaction that God has blessed many relationships, so we move on to a new life in the UK both with sadness and contentment. As we begin to resettle in the UK many challenges lie ahead of us, with a real sense of dependence upon God as He begins to write upon what currently feels like a very blank piece of design paper. It is also a time for new beginnings at St. Luke’s. Dr Lugwisha successfully completed his Assistant Medical Officer training course in August, and is now the Tanzanian equivalent of a qualified doctor. Pray for him as he returns to give direction to St Luke’s. Peter Brook, a British Palliative Care Nurse, is coming with VSO to oversee several aspects of the work, notably the Home Based Care service, as well as keeping an eye on other St Luke’s activities. Meanwhile, two of our best nurses have moved to work for the Government, so the nursing services will be sorely pressed. The new Clinical Officer Dr Job, who was recruited to take over the day-to-day workload left by Rachel, has proved a great success; he is temperate and hard working and has proved good at filling some of the leadership gap left. There is also a temporary manager until Peter arrives in October. Dafrosa, the HIV Counsellor, is also doing sterling work in keeping things running as smoothly as possible. The HIV team have been able to run a recent seminar for all the Clergy in the Diocese, on Bereavement counselling. This has been very well appreciated in covering an aspect of their work where their training has been minimal. It is helpful for them to share experiences and ideas, and support one another in this important work. Two new Field workers have been recruited for the HIV project following the sudden and unexpected death of one field worker while he was out in a remote village meeting with leaders – he had an acute severe asthma attack. We were all deeply shocked and saddened by this event. The work continues to expand, and we are now caring for around 1,000 infected people, providing access to services and basic medicines and support for them. We were also stunned and distressed by the sudden death, two days after we returned to UK, of Can. 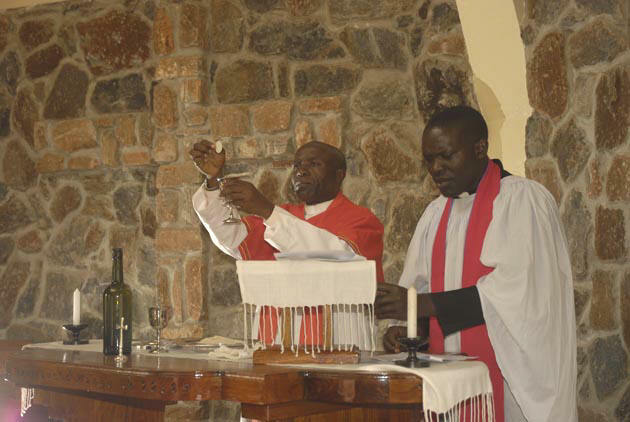 John Madihi, the Dean of All Saints Cathedral Mpwapwa, and the Vicar General. He will be sorely missed by the Bishop and the Diocese as a very wise and godly leader. Three or four of the senior Clergy had earlier been given the opportunity to study for higher qualifications for 3 years at the new St. John’s University in Dodoma, so there is a large gap in the higher levels of strategic placement of ordained staff around the Diocese. One of the real joys of our last four years of our time in Tanzania was becoming far more actively involved in the local parish in which we had worshipped since first arriving in Mpwapwa. This built up some very firm friendships particularly with the Church Secretary and his wife, Vincent & Violet Shauri, both of whom are wise lay leaders and have a real heart desire to see the Church develop and expand - both spiritually and in its outreach to the community, particularly with its work amongst the AIDS orphans. It also faces a major challenge and huge opportunity to reach out to many outsiders who have been flooding into Mpwapwa following the discovery of a sapphire deposit which has engendered a ‘gold rush’ culture. As the extent of the outcrop became evident, large numbers of Sri Lankans and Thai nationals have set up shop as middlemen in Mpwapwa – but far from bringing prosperity to the town those who had been there before can no longer afford to rent houses and general food prices have gone up five-fold taking an already difficult economy well beyond the reach of many. Added to this, are the more unsavoury aspects of (not always) petty crime and nightlife which have come in the wake of gem dealings that will require an ongoing ministry to reach out to broken lives for many years to come. P The various building works completed that will enable local Christians to take the Word of God to their neighbours. P a very positive time during the various farewells and all God has enabled during our Mpwapwa Years. P The provision of housing to tide us over during our first year back in the UK. ^ Esther and Christopher and Timothy as they start in new Schools. ^ wisdom for those taking up the management of St. Luke’s with a staff team with of varied temperaments, abilities and objectives! ^ godfrey that he will find work in a very tight market place.